319 patients with a solar retinopathy were seen in an eye clinic in Nepal within 20 months. All patients had either a positive history of sun-gazing or typical circumscribed scars in the foveal area. In more than 80% of the patients the visual acuity was 6/12 or better and did not deteriorate over time. 126 (40%) patients had a history of gazing at the sun during an eclipse, 33 (10%) were sun worshipers and 4 (1%) were in both categories. Three years later 29 patients were re-examined in a follow-up study. Only 16 had had visual disturbances directly after they had gazed into the sun. No colour vision defects were seen in any of the 44 affected eyes, when tested with Panel D 15, while four patients (6 eyes) had some uncertainty with the tritan plates of the Ishihara test charts. Metamorphopsia were recorded in 11 eyes. 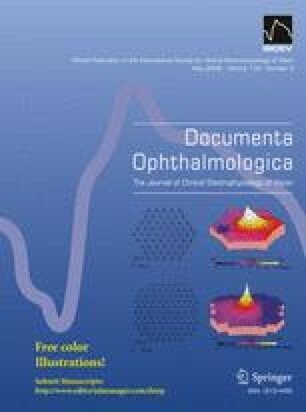 Five German patients with solar retinopathy were examined in more detail. Colour contrast sensitivity (CCS) was tested for the central and the peripheral visual field. CCS for tritan axis was raised in all patients for the central visual field, while it was normal for the peripheral visual field.